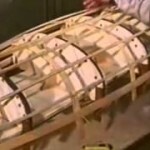 Step by Step How to Build an Ultralight Canoe Online Video Course This easy to follow step by step online video will take you carefully and clearly through every stage of building a beautiful ultralight skin-on-frame boat. We'll mail you a Step by Step How to Build an Ultralight Canoe Video on a USB Stick AND you'll have access to the online video. 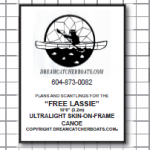 This easy to follow course will take you carefully and clearly through every stage of building a beautiful ultralight skin-on-frame boat. See the video page for more details. 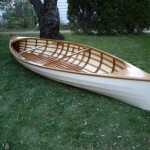 Downloadable full sized plans to build an ultralight one person skin-on-frame canoe – beautiful, super tough, safe and durable. The finished boat weighs about 20lbs, is 10.5 feet long and tough as nails. It is stable and will safely carry an adult and a small child (or dog). The tumblehome on the boat makes it very difficult to capsize – it is designed to stay upright and keep its occupants safe and dry! Great for exploring. The design is based on Rushton’s Wee Lassie, but has been adapted for skin on frame. it has proven to be an extremely versatile boat, as tough as it is light. 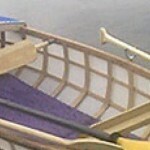 Downloadable full-sized plans to build a two person ultralight skin-on-frame canoe. This versatile boat has the comfort of a canoe but the manoeuvreability of a kayak. The paddler sits on the floor and can use either a single or double paddle. This canoe is 14.5 feet long, approximate weight 33 lbs. It will carry 2 adults and a small child (or dog). Downloadable full-sized plans to build a elegant skin-on-frame rowboat which is versatile and very fast. It will carry 2 adults and 2 teens. At around 45lbs and 14,5 feet, the finished boat will still be easily manageable to lift on top of your car. 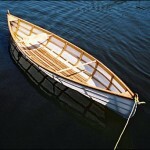 Small Adirondack guide boat - designed by Henry Rushton. We'll mail you full sized paper plans to build an ultralight one person skin-on-frame canoe – beautiful, super tough, safe and durable. The finished boat weighs about 20lbs, is 10.5 feet long and tough as nails. It is stable and will safely carry an adult and a small child (or dog). The tumblehome on the boat makes it very difficult to capsize – it is designed to stay upright and keep its occupants safe and dry! Great for exploring. The design is based on Rushton’s Wee Lassie, but has been adapted for skin on frame. it has proven to be an extremely versatile boat, as tough as it is light. 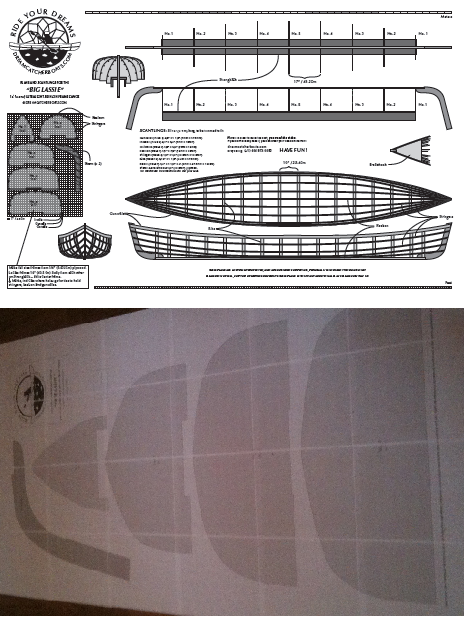 We'll mail you full-sized paper plans to build a two person ultralight skin-on-frame canoe. This versatile boat has the comfort of a canoe but the manoeuvreability of a kayak. The paddler sits on the floor and can use either a single or double paddle. This canoe is 14.5 feet long, approximate weight 33 lbs. It will carry 2 adults and a small child (or dog). 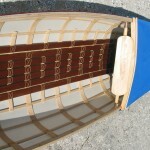 We'll mail you full-sized plans to build an elegant skin-on-frame rowboat which is versatile and very fast. It will carry 2 adults and 2 teens. At around 45lbs and 14,5 feet, the finished boat will still be easily manageable to lift on top of your car. 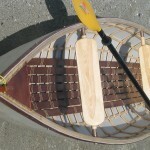 The kit contains everything you need to build a two person ultralight skin-on-frame canoe, excluding the wood. It also contains a hard copy of the Boat Building Course video on a USB stick and the full-sized paper two person canoe plans. This versatile boat has the comfort of a canoe but the manoeuvreability of a kayak. The paddler sits on t he floor and can use either a single or double paddle. This canoe is 14.5 feet long, approximate weight 33 lbs. It will carry 2 adults and a small child (or dog). For more details see the kits page. 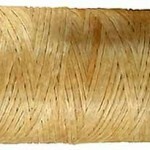 This is $10 per linear foot, 60″ wide. Just enter the number of feet you require in the quantity box after adding it to the cart. Receive the supervision and guidance of Brian Chandler, a boat builder with over 20 years’ experience as you build your own beautiful ultralight, super tough skin-on-frame one person canoe/ open kayak. Dreamcatcher boats are built on the K.I.S.S. principle (keep it simple stupid). 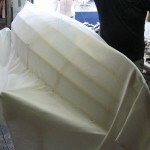 These are ideal projects for the beginner boat builder as well as the advanced craftsman. (Optional deck costs extra.) No previous experience necessary. Price includes all materials, use of equipment and individual tuition. 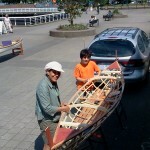 See Description for the one man canoe building class. 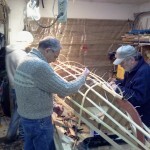 Friends are welcome to join and help in your boat building experience. It makes a great family bonding activity! 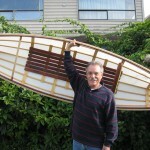 Join a group of people to build your own ultralight boat. Bring a friend or two to help out. The class runs from Saturday to Saturday. The next class will be held from October 1st to 7th 2016. 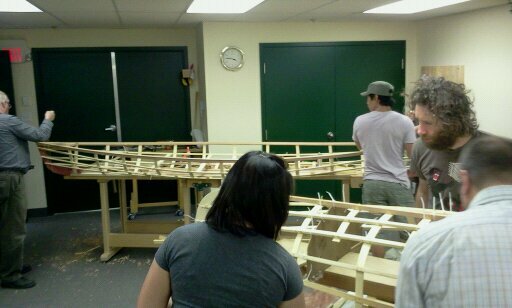 Over 2 full 7 hour days a group of 8 people will build a boat together under the expert guidance of Brian Chandler. 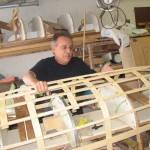 This is a fun, hands-on workshop during which you will learn the abc’s of building a skin-on-frame boat, from setting up the station molds to skinning the boat, along with boat building tips and techniques which will make it easy to build an ultralight boat. This includes the price of a single canoe/kayak kit (for a double add $50) so you can go home afterwards and build YOUR OWN ultralight boat. See description of kits at Kits The boat will be available for purchase at the end of the class for $650.